This year, the Funko Pops were not decimated. Force Friday is the name Disney gives to the big, simultaneous release of all the toys and merchandise for the newest Star Wars film. Lucasfilm has been choosing a single day to hype up its products (and the upcoming movie, of course) since The Phantom Menace days, but Force Friday is something even more intense. 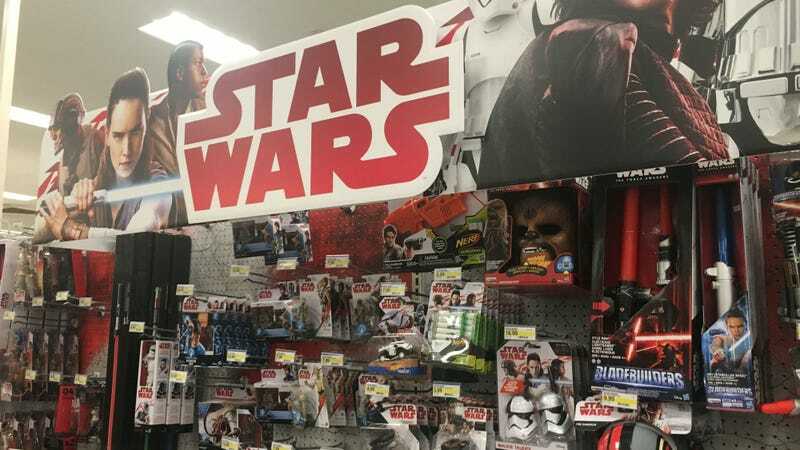 The inaugural event was in 2015 for The Force Awakens, and the anticipation for the first new Star Wars film was at a fever pitch; between the mania for the merchandise and massive disorganization between the toymakers and the toy stores, the first Force Friday was a bit of a disaster. I’m happy to report that Force Friday II, which began at 12:01 am ET last night, went much more smoothly. That’s a relief to me, and I’m not just saying that because I was able to score the stuff I was looking for with relative ease. It’s because the first Force Friday was one of the more traumatic events in my professional career. Here’s what happened: In 2015, I went to a Toys R Us outside of San Francisco, Calif., and was met with almost completely empty shelves and lots of disappointed fans. A search on Twitter made it clear I wasn’t the only one who felt that way. So I wrote about it. No matter how disappointed I may have been in the experience itself, it never could’ve prepared me for what happened next. The response was resoundingly negative. And not negative like, “I had a great time, what are you talking about?” although there was certainly some of that. Negative like, people wishing that I was dead. Angry employees calling and texting me. “You’re the reason I believe in white genocide,” tweeted one person I quickly blocked, who seemed to think that was an appropriate response to a critique of a marketing event. Instantly I became the poster child for everything wrong with nerds, a 30-something man crying about not getting his toys. Now, was I grown man crying about not getting toys? Yeah, kind of. But I was trying to use my experience and disappointment to illustrate the fact that the event, which should have been fun—or at least allowed Star Wars fans to buy the merchandise—was poorly executed. The fact so many people shared my experience made me think it was a story worth telling. In my mind, it was a business article. In the internet’s mind, it was a call to arms that I sucked. For weeks my Twitter mentions were heinous. It even unintentionally inspired a meme, one that I was not even aware of until 10 months later when some friends drunkly started quoting me, to me, without me knowing what they were talking about. They were quoting a line from the first article which particularly got under people’s skin and it actually became a meme, of sorts (click here for proof). There are people still tweeting what has become a dark mark on my life, the now infamous line “The Funko Pops had been decimated.” It’s become so prevalent, just this morning, Lucasfilm’s own Pablo Hidalgo threw it out there on Twitter. But when you write on the internet, you have to be ready for that kind of reaction. At that time, I hadn’t been, but that’s okay. It just meant I had to go to Force Friday II, and do it again. I had to go to a local store, wait in line, see if the toy companies and retailers had learned anything, then tell the world about it. Once again, this year companies promoted the crap out of Force Friday. There was an multi-store AR game created for it, major ads with dozens of major retailers, exclusive releases, parties, and so much more. But... would the products actually be there? Would fans enticed by all the promotion be able to go to stores and buy The Last Jedi merchandise? Last night, I set out to find out. My wife and I headed over to Target in West Hollywood, California, two hours before the midnight release. We were fifth and sixth in line. Target’s employees were well-informed about the night’s proceedings, and gave us raffle tickets and more. Plus, because they can’t hide full toy aisles, we were able to sneak a peak at what was on the shelves. Most importantly, we could see how many of everything they had in stock. Everything was promising, and everyone in line was very upbeat. This was after about 20 minutes. Lots of sales, but still stuff available. Target had two of these giant Porgs for giveaway via raffle. Turning to Twitter, it seemed like our experience was in line with a good amount of people. Most people who arrived early to stores across the country seemed pleased, and even people who arrived closer to midnight were still able to get a few cool items. Of course, I did get reports of fans in certain areas where store employees didn’t understand what was happening, and/or didn’t limit the amount of items people could buy (Target told everyone only two of each item was allowed); some stores hadn’t even set up for the event at all. Others complained about low stock on figures but, in almost all cases, those were the very popular six-inch Black Series, which was to be expected. So was Force Friday II perfect? Of course not. An event this big, happening at so many different stores with so many different people, could never run perfectly. But there is no doubt stores were much more prepared for the event, and were even enthusiastic about it. And I’d still be reporting that, even if I hadn’t been able to grab the toys I had been looking for. Star Wars: Episode IX comes out May 24, 2019, so Force Friday III won’t be held in September next time, but presumably in the spring. And hopefully Disney, Lucasfilm, Hasbro, and all the toy stores will have worked out even more kinks by then, although there’s always the chance the event will backslide into chaos. Either way, I will be here to report on the decimation level of the Funko Pops. It is my burden, my responsibility, and my job. And I shall not falter.